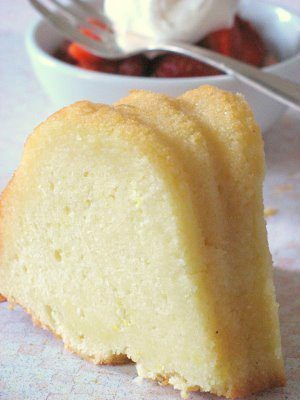 This white chocolate poundcake is so moist and delicious with that white chocolate glaze! Poundcake is perfect for a picnic – no melting and it’s firm enough so it’ll hold up in a loaded picnic basket. Unfortunately, I’ve had this recipe written down for so long that I no longer know where it came from. It’s really really great though – one of my favorites! Preheat oven to 350 degrees F. Grease and flour a bundt or tube cake pan. Melt the white chocolate in the 1/4 cup of hot water in the top of a double boiler. When melted, set aside to cool. In a large bowl of an electric mixer, beat shortening and sugar together well. Add eggs one at a time, beating well after each addition. Stir in the vanilla. Add melted chocolate mixture and blend on low speed to combine. In a medium bowl, sift together the flour, baking powder and salt. Add to the sugar mixture alternately with the milk, beginning and ending with the flour. Pour into prepared pan, and bake for 1 hour and 15 minutes or until tester comes out clean. When done, cool in pan for 10 minutes, then invert onto a wire rack to cool completely. In a medium saucepan over med-low heat, combine the butter, evaporated milk, sugar and white chocolate. Cook, stirring constantly, until mixture comes to a boil. Boil 1 minute; remove from heat. Add vanilla, and beat until thick. Pour over cooled cake.